In India, 65% of the total geographical area is covered by hard-rock formations, of which 40% are in the semi-arid zones. The aquifers in these zones generally have low storage and yield capacity as the underlying hydro-geological units are either volcanic or crystalline aquifer systems. In the light of this fact, groundwater levels continue to decline due to excessive pumping for irrigation purposes. This is further intensified by subsidised electricity and changes in rainfall regimes in the region. The increase in the frequency of droughts in the recent decade due to variability in rainfall and temperature increase has exacerbated its impacts on agricultural production. The result being, many farmers relying on other forms of livelihood or are migrating to cities for employment. The repeated crop failures and surmounting debts is making farming unsustainable. Unable to pay these debts, farmers, unfortunately, resort to committing suicide. Also, conflicts and competition over access to limited groundwater resources are increasing day by day as a result of fragmenting landscapes. The magnification of these issues has implications on the five pillars of sustainable capitals -natural, social, human, financial, and physical. 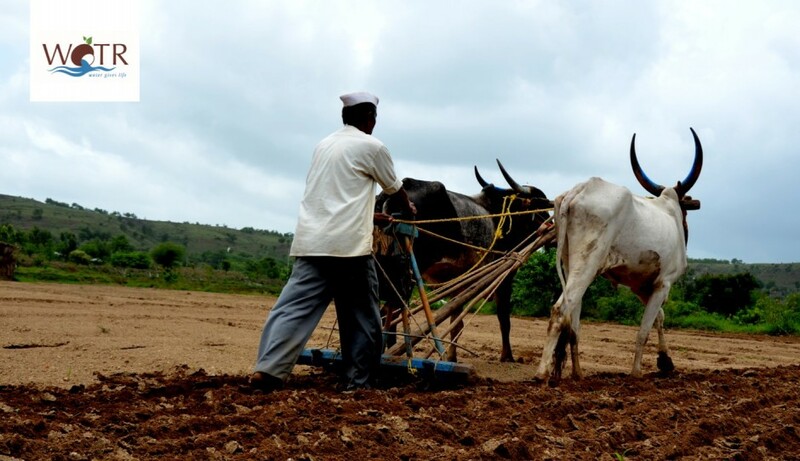 The central and state drought-relief schemes, as well as loan waivers are neither a solution on the ground nor a help to incentivise farmers for better management of their dwindling groundwater resources. A good rainfall year does not ensure debt recovery for the farmers. The repeated phenomenon of droughts paralyses the farming communities, making them even more vulnerable to climatic and socio-economic stresses. The result being, farmers continue to borrow money to invest in the drilling of new and deeper bore-wells in hard crystalline rocks, with a hope that it will provide critical irrigation to their field. However, they do not succeed in getting good yielding wells. Borewell drilling in crystalline aquifer system adjoining a GMI group in Israipally, which went dry. Such events are quite a common phenomenon in Telangana, wherein the number of failed borewells continue to rise and the spacing of new borewells with the old ones are usually less than 5 m (see pic 2) causing well interference. This increases the pressure on the groundwater resources calling for more investments by the farmers leading to a debt trap; under this pressure, farmers choose to end their lives. As a result of multiple wells pumping water from the same aquifer, (see pic 3) the drawdown exhausts the existing groundwater resources. The hard-rock formation impedes the ability of inter-aquifer transmission, thereby creating greater drawdown and low recharge capability. If the livelihood of an agrarian community has to be secured, there has to be a collective use and management of the natural capital. This means investing in reviving the groundwater and collective use of the shared resources. Pooling/sharing of groundwater by farmer groups is a step closer towards reversing the trend of declining groundwater resources, especially in hard-rock regions. It is similar to carpooling in the cities where people come together in order to reduce congestion on the roads and their carbon footprint. Bore-well pooling has the potential to help in regulation of wells, reduce competitive drilling, minimise losses during extreme drought events, revive the groundwater tables and build a collective ownership of the common-pool resource. Additionally, it helps farmers to take an informed decision of what crops can be sown for a particular season thereby, reducing the risk of crop loss caused by reduced or no irrigation. It also helps them regulate their input application thus securing the crops further. To make the groundwater-pooling more practical, there has been rigorous efforts to build the capacities of these communities, wherein inputs on hydrogeology and groundwater availability, monitoring groundwater levels to aid in identifying recharge zones, methods to assess the changes in water levels for better groundwater budgeting. Additionally, help in setting up micro-irrigation systems like drip and sprinklers and inputs on crop planning, adoption of System of Crop Intensification (SCI) methods in farming and preparation of organic manure and creation of recharge trenches and farm bunds have been provided . (see pic 4) These efforts are helping in sensitising the rural communities about the advantages of crop planning irrigated on the shared resource; thereby laying down the blueprint for groundwater sharing. Starting with only a few farmer groups, more farmer groups are joining as they realise the advantage of the shared use of groundwater. Currently, 73 farmers have come together to try out this approach and a few more are willing to try! Groundwater-pooling has the potential to reverse the declining trend of groundwater in hard-rock zones. With more farmer groups emulating such shared approach, this model has the potential to be an effective strategy in managing groundwater resources. It is therefore imperative to incentivise such models to bring farmer groups together to better handle their natural capital. A wider sharing of the common pool resource among various social groups and access to it on a protective basis can stabilise dry land farming and ensure food security. I didn’t realize that if you drill two water bores too close to each other than it interferes with their ability to produce water. This makes sense because the water that is being pulled up would be directly from the ground. Having two wells that are too close would be sucking water from the same ground which would mean less in both. Yes, that’s true Todd! Borewells tapping the same aquifer will have well interference. Ideally, there needs to be spacing between borewells and farmers need to be provided with this crucial information and most importantly groundwater needs to be looked as a collective resource. Borewell pooling is way towards managing groundwater.